What a difference a year makes! Last summer, most of our adult tagged females were 500 miles away to the northwest. They were nesting at East Island, French Frigate Shoals. The place was rather bare save for the presence of Tiamat, who stayed home. Summer 2003 is quite a contrast. The females are now Home. One by one we've sighted them. Tutu. U249. 605C. McTaggert. This week, Shredder made her first appearance. Another duck on the pond. Shredder made her first appearance. All these females have an important job to do in their nesting off-season. They must eat and rest and do all the things necessary to prepare for new eggs to develop inside them. 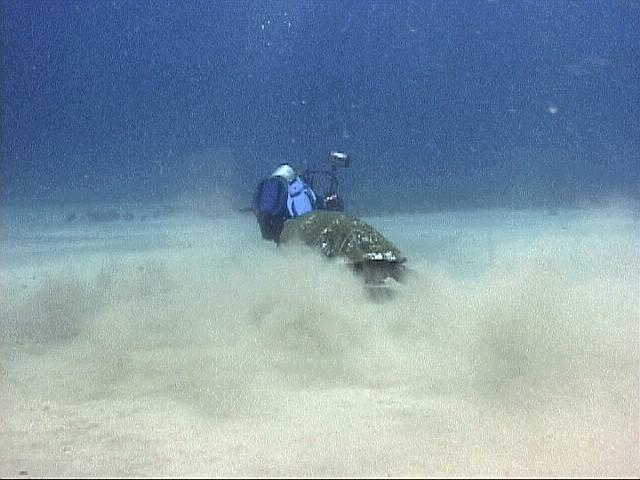 We have enormous interest in the foraging habits of the turtles we are studying. We now know from our TDR (Time-Depth Recorder) results that the honu here feed mostly at night--and close to shore. Daytime is their sleep time. 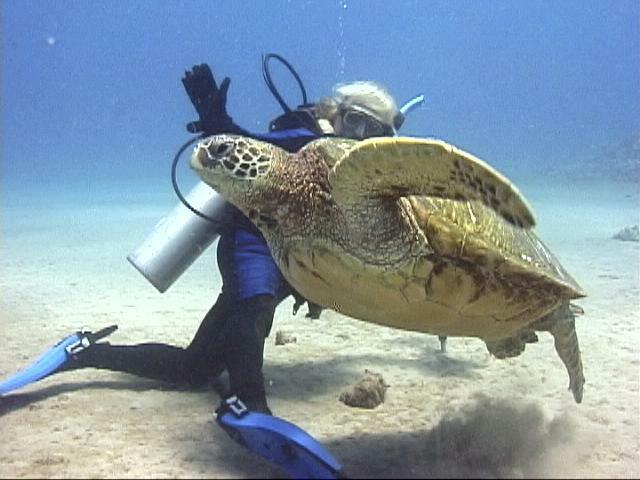 So we consider ourselves fortunate indeed when we happen upon a turtle snacking during the day. This week we came upon a turtle doing just that: feeding on the tips of Halimeda. 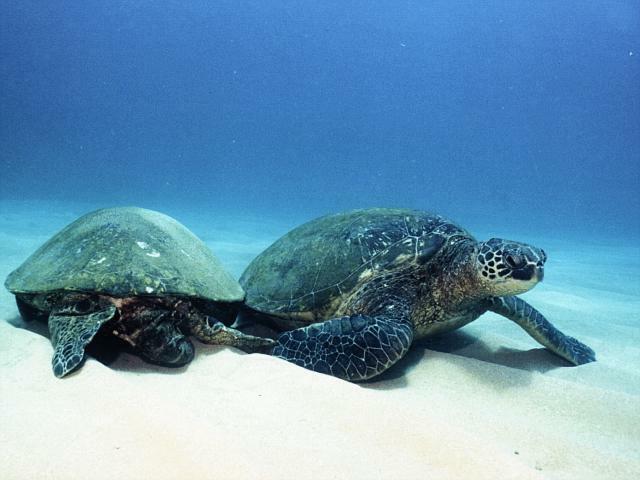 After a few nibbles, the honu then swam over sand, and Ursula swam alongside at a respectful distance. Of course this honu didn't feel the same way about people. 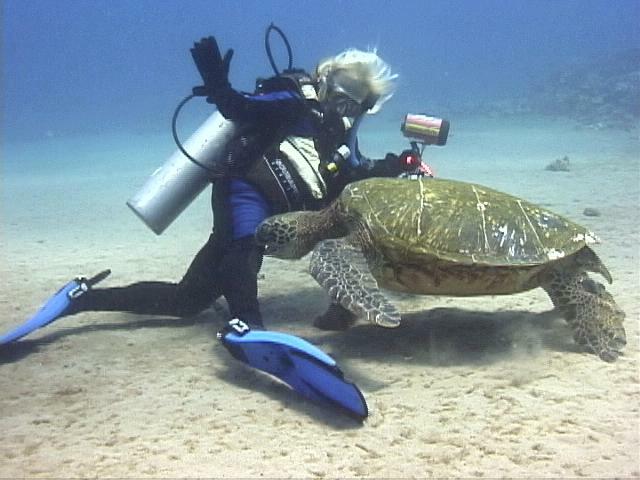 The turtle changed position only to plant another bite on Ursula's right knee, but her new dive suit has such good padding there she felt nothing at all. The honu, seemingly satisfied that a point had been made, then lifted as if to swim away. Ursula decided to swim away also, pretending not to be interested in the turtle. She turned her back, hoping to put the honu at ease. 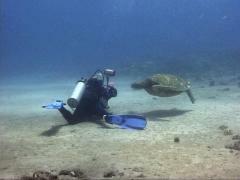 It worked--the honu started to follow her! 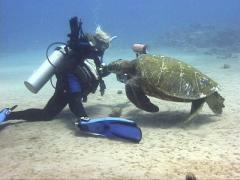 Ursula headed for the Halimeda beds and began "feeding"--plucking tips off plants and tossing them about much like the honu themselves do. This seemed to get the turtle interested in feeding. 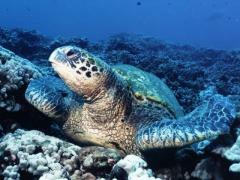 The honu then swam along, plucking small mouthfuls of seaweed from the bottom. Some dives are certainly more interesting than others! We returned to Kuamo'o again this week. Kuamo'o is truly a remarkable place. It also presented us with a happy surprise. There was a male there with tags. We'd tried unsuccessfully to read them during earlier visits but this time we managed to. We discovered that he was K808--a male we've also sighted at Honokowai! 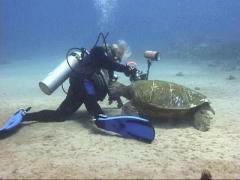 Thanks to George Balazs, we know K808 is a Big Island turtle. He was first tagged by George on May 15, 1994, at Kahaluu Beach Park, Kona. 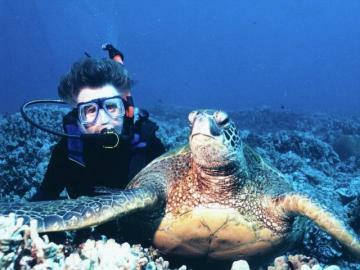 K808 is one of several turtles from the Big Island whom we've sighted on Maui. These turtles plus our resident V133 (first tagged on Molokai) help George understand the inter-island migrations of immature honu. K808, on the left, shuns the camera. What with all our obligations (which start every morning at 5 AM) we've had precious little time for Fun. We realize that we've focused far too much on what we still have to do rather than enjoying what we've accomplished so far. Even the photos we take all have a purpose. Photos of turtle feces (in situ, macro shots), photos of flippers and claws and jaws and algae, and this shot missed and that shot left unshot. This is our favourite photograph of the week. It is simply Peter enjoying the company of a highly photogenic and cooperative young male named Hoa (Hawaiian for "companion"). We've known Hoa since 1997 and he's been with us every summer since. We watched him grow the long tail of a male during that time. We delight in this special honu's gentle company. Best of all, this pic just makes us smile. Peter and Hoa pose together. Peter is the one with the funky hairdo.